Everyone needs a smart phone to communicate but today communication is not the need only, one wants also entertainment with communication and it is like Entermunication. Suppose as that you are traveling or sitting in home and your electricity gets off and perhaps in college you feel like a boring person then to get off with your boredness what you need, of course it is entertainment but not everywhere you find it when you need instantly, for it you have to go somewhere to get entertained. It is like sweating out whether you go to a cinema hall or go to watch a live performance or it can be anything but nothing like home entertainment as one wants it. Everything and everyone entertaining is around you but how to get it. 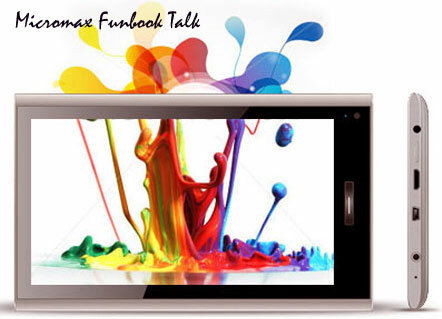 For it there is only one device that can give you all and it is Micromax Funbook Tablet. It is with superb processor with superb speed and connectivity and with lots of user friendly applications that one wants in a device. It comes with 1GHz processor having Android operating system giving 5 hours of talk time with 2800 MHz battery. It is TFT-LCD multi touch screen measuring 17.8 cm of screen and 800×400 screen resolutions. It has 0.3MP front camera with Bluetooth, WiFi and EDGE facility. It has 3G connection, 3G dongal support and calling facility. It is with 512 MB RAM, 4GB ROM with 32 GB expandable memory having G sensor, proximity sensor and motion sensor. It also has USB connection and 3.5 ear jack. There is already with pre-stored application as entertainment, Mstore, Google tribe, Movies and E lea and also with multiple audio formats support. So this Micromax Funbook is really good in fewer budgets if you really do not want to spend much money on high-end tablets. It comes with all what you are looking for in a tab, so have fun with Micromax Fun book.